John Forbes Nash Jr., was one of the most brilliant minds in his generation of the new ambidextrous mathematicians, who worked both in pure and applied mathematics. True to his calling, he viewed his personal decisions as calculations of advantage and disadvantage, a playing ground for dominant and dominated game theories. Little did he know that his insight into the dynamics of human rivalry, his theory of rational conflict and cooperation, was to become one of the most influential ideas of the Twentieth century. "A Beautiful Mind: The Life of Mathematical Genius and Nobel Laureate John Nash" details the tortuous life experience of this 1994 Nobel Prize winner, a tome that landed writer Sylvia Nasar the 'Winner of the National Book Critics Circle Award for Biography". 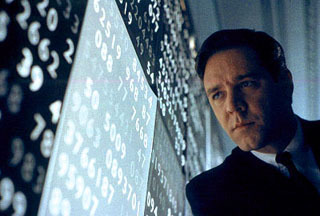 This heartfelt account of the brilliant mathematician eventually caught the interest of Hollywood director Ron Howard, who decided to turn Nash's story into a film, with Academy Award-winner Russell Crowe in the lead. Despite the wholehearted backing of Universal Pictures and Dreamworks SKG, and the Oscar-worthy talent brought on board, I felt doubtful that the film could do justice to the legendary exploits of John Nash. However, not only were my doubts laid to rest, but I was also pleasantly surprised to find that film focused more on Nash's fabulous and faithful wife Alicia-- as a matter of fact, the biography is dedicated to Alicia Esther Larde Nash, who played a key role in Nash's accomplishments. As one of the only two female students in Physics at MIT during the early 1950s, Alicia was tender as a greenhouse flower and radiant as a sweet summer blossom. However, despite her gentle demeanor, Alicia showed surprising persistence when her husband was felled by schizophrenia in the midst of expecting their first son. She lived the prime decades of her life under a shell of disappointment and ignorance, with a firm hope that her husband would recover one day. It was because her firm belief and patience that brought Nash back to the normal world. If Nash could successfully calculate the advantage and disadvantage in a game theory context, how could he explain Alicia's sacrifice in their relationship? In a mathematical sense, if genius is considered as the positive infinite, feeble-mindedness is not far away from the negative infinite. Nash was the type of person who lived on the border between these two diametrically-opposed states. One miscalculated misstep, and he would fall close to the brink and possibly never come back. However he did come back, a feat that could only be explained by the miracle of love. Love is a dominant strategy. In a game, if your competitors have one strategy and you have several strategies, one of which will yield a better outcome than that of your opponent, game theorists will call this a dominant strategy. Nash's miraculous recovery is a vivid example of this concept. In his life game, Alicia preferred the dominant strategy, which was to stay with him, rather than give up and leave. It was because of her dominant strategy that Nash was brought back from the brink of insanity, yielding the best outcome. 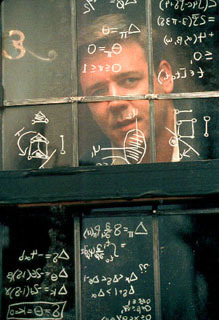 A number of the film's heart-wrenching moments help drive this point home, such as Nash wandering around Princeton as students mock his unwieldy body gestures, Nash skipping his medication in the hope of more intimacy with his wife, and Alicia's discovery of Nash's imaginary code-breaking duties for the Department of Defense. If anyone was Alicia, could she have held on to such a man for such a long time? The movie "A Beautiful Mind" is a timely reminder of the power of love and loyalty in a modern world marred by divorce, domestic violence, and betrayal. And though the film has certainly taken some dramatic license with the actual details of Nash's life, there is an emotional truth to the story it tells. As a footnote, driven by my own interest in game theory (which I had studied during my undergraduate education), I recently had a chance to speak with the real John Nash and his press agent Mr. Mayer. I posed the question to Mr. Mayer, "Do you think the movie did justice to Dr. Nash's life and achievements?" His answer was, "Unequivocally yes, I think it did!" To visit Michelle Shen's homepage, click here.